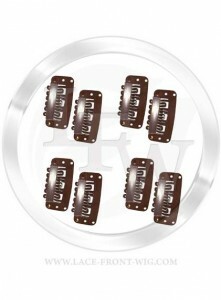 Browsing: / Home / What Type of Wig Clips Are There For Lace Wigs? There are many different type of wig clips, toupee clips and hairpiece clips used today. 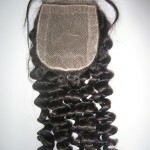 If you want the best wig clip that offers security, comfort and can be attached easily then Lace Front Wig recommends the U Comb Metal Wig Clip. This particular type of wig clip is also used for toupee clips and hairpiece clips and can be utilized on hair extensions, lace frontals, lace partials, wigs, lace wigs, and hair accessories. You can attach it quickly and easily by sewing it into the hair item with a needle and thread. If you can sew on a button, you can sew on a wig clip or hairpiece clip. What Size Do The Wig Clips Come In? The wig clip, toupee clip and hairpiece clip come in three sizes. They are considered small, medium and large which represents 2.2 cm, 2.8 cm and 3.2 cm in width, respectively. They are constructed with flexible metal and have a silicon backing that will hold the hair tightly for a secure and comfortable hold. Based upon the amount of hair you want the wig clip to attach to will determine the size you select. For the best hold and most comfort, most clients select the 2.8 cm size. 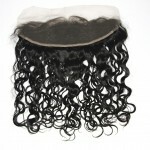 Once attached, you can simply slide the hairpiece clip or wig clip into your own existing hair and snap it into place. The metal wig clip locks into place holding your hair tightly but comfortably. You can control the amount of hair it will hold, the tightness of the attachment and where to place it in the hair. What Color Would You Recommend? At Lace Front Wig we offer wig clips wholesale and carry three primary colors. The colors are black, brown and light beige or blond. 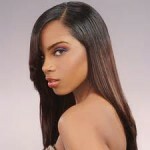 You should select the color that would most closely match the color of the hair you are attaching. If you are using it to add a hair accessory, then select the color that most closely matches your own hair. For example, if you are putting on a blond wig and attaching it to your own hair which may be brown in color, a blond or beige wig clip would be used. If you have black hair and you are putting a feather extension into your hair with the wig clip, then a black wig clip would be selected. You can adjust the hold, tightness of the bond and where you would like it attached. Do Wig Clips Look Natural When Attached? If you want to attach a hair extension, lace wig, wig, toupee or hair accessory quickly and easily then wig clips are for you. When you attach a wig clip into your own hair, it will blend perfectly and effortlessly. It usually is attached under the hair accessory, wig, toupee or hair extension and hidden from view. 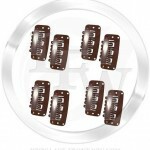 With a small investment in wig clips, you can have the hair you always dreamed of quickly, easily and securely. Try some today and see how secure they really are – regardless of the hair you are wearing.